Four days later and I’m back with another Patreon sketch. 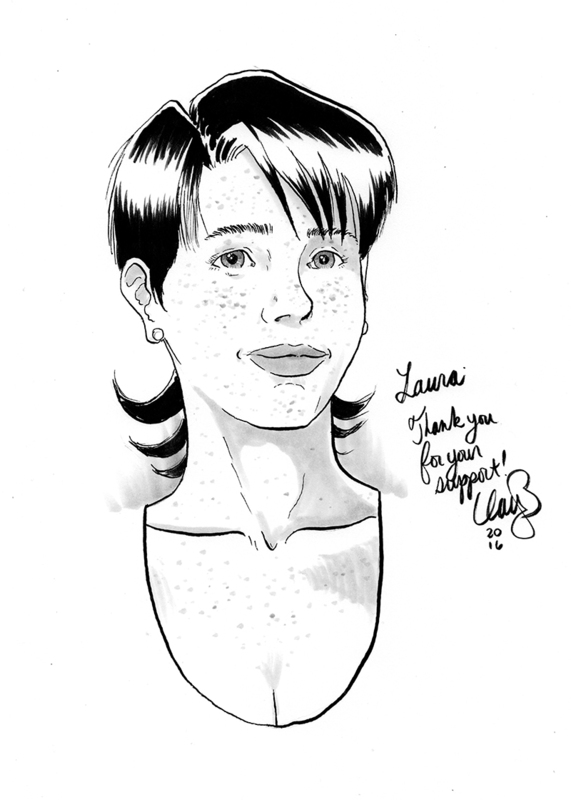 This one goes out to Laura, who requested Wren for her sketch, and it’ll be going out in the mail tomorrow. I’m catching up! Anyways, I hope to be totally caught up on all the depcom stuff by the end of the winter break. Thanks for sticking with me, I’ll be doing more. Yes, I’m backlogged to October … back when the Election hadn’t completely crushed our hope in humanity … anyways, getting ahead of myself. Here’s the October Patreon Sketch for Mink Rose who asked for depressed character #7, and I’ll be shipping this out on Monday. 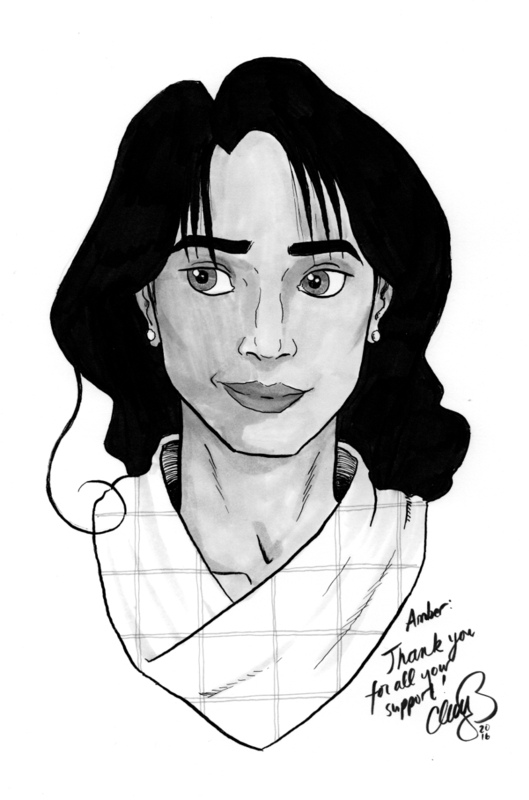 Thank you Mink Rose and all the people who support my work and the work of others’ on Patreon. It’s a great system and I’m deeply honored that many of you support it. I’m going to try to do the November, December, and January sketches over the break, so we’ll see you soon. Maybe SOMEONE will request Wren (supporting character #9; freckled girlfriend) or depressed character #4, both whom I’m dying to draw but no one has requested yet. It’s been a while and I’m really behind but here are two Patreon sketches. 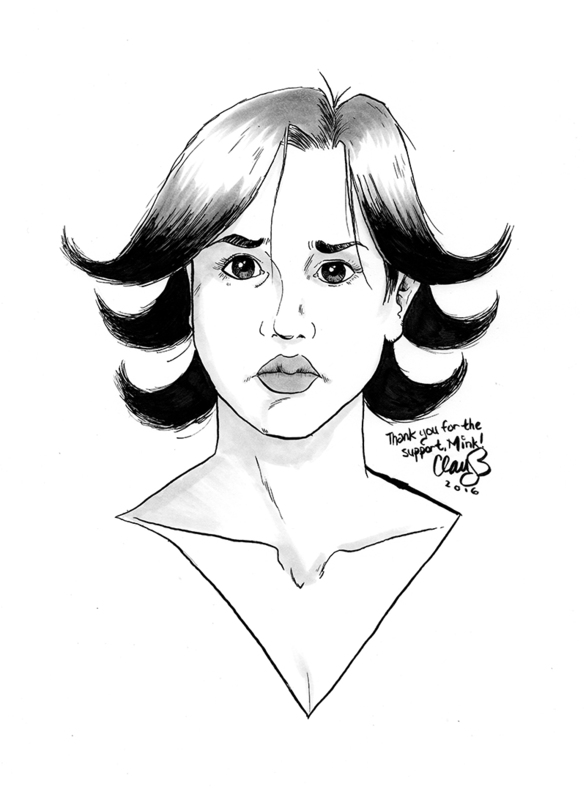 One lucky winner gets a sketch of a character they like for supporting depression comix. Here are the sketches I made for August and September (I am really that far behind). This sketch was made for Amber and it features the sister of one of the depressed characters (she doesn’t have a number, I’m behind in that too). This is depressed character number 2 for Alexander. As I want every sketch to be unique, the popularity of this character is making new pics a bit difficult but that’s part of the challenge. Thank you for supporting my work on Patreon! Because I haven’t answered this question is why I keep going on. While I’m doing this, I’m reading your comments, listening to your stories, feeling your hurt, and it has helped me immensely to try to come closer to the answer. I want to know because like many of you depression has changed my life for the worse so much I can’t even imagine what my life would be without it. So through this comic I try to come to an understanding. There is no “why” to depression but still I have to know. It’s a quixotic thinking, I know. It just is, and my inability to accept that and move on drives me to do this comic. Another drive to do this comic is you. If you’re reading this, then you have helped my motivation at a level enough to continue this project, when my past projects sputtered and failed. So thank you for everything — your comments, your mail, your likes and follows, your support through Patreon and PayPal. It all means a lot to me and it encourages me to continue, nicking at the heart of depression one week at a time. 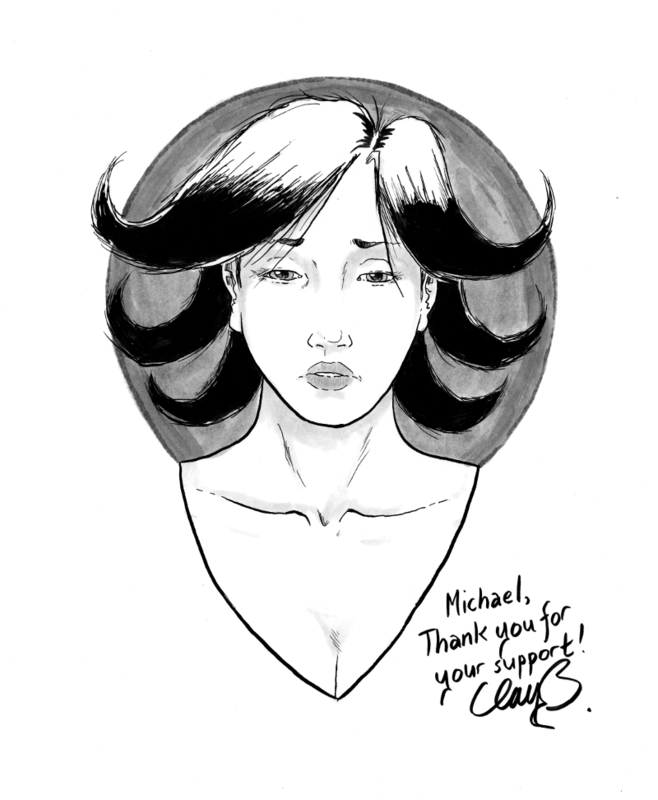 As July comes to a close in its last few remaining hours for those in North America, here is the Patreon sketch winner for July, and Michael, the winner, has requested depressed character #7 for his sketch. The sketch will be in the mail today. In August there will be another sketch up to win and all $1.00+ Patreon supporters have a chance to nab it. Thank you all for your support in July and there will be more to come in August. Three hundred strips. In most cases, it would be cause for celebration, but this isn’t really a comic about celebration. I started this comic in September of 2011. Since then, I’ve completed those three hundred strips, but another number echoes in my head as well. Not five years, although I’m approaching that. But that’s the number of readers that I know about who are no longer with us due to severe depression. Of course, this is not something I know of directly, but from E-mails from their family members and significant others who have told me. Compared to the tens of thousands who die annually from depression it’s a small fraction but it’s still an important number to me. I receive a number of E-mails and messages from people who are on the edge and looking to die. I do my best to help them, but I know from personal experience there isn’t much I can say. I know when I was in that place there wasn’t anything anybody could say that didn’t sound contrived and condescending, or so blatantly wrong according to the view of the world depression had given me, so I accept that whatever I say will be framed similarly. I do my best and hope that they won’t end it, but I know the grip depression has on people, and I hope that it’s just loose enough to make it through the night. I think I’ve saved a few people, but the problem is there will be another 4am for them and I might not be there to listen. Sadly, saving people from depression sometimes is sometimes only too temporary. So, as I look at that three hundred, I also want to remember the five. I’m so sorry you are not here. And for those of you still here, I want to hug you all and thank you for toughing it out with me. For those who had a close scrape with the end I want to hug you even tighter because I remember full well how chilling those nights were and they still scare me sometimes. But we’re here. And for those of you who support me doing this instead of making stupid joke comics because this is the only thing I’m capable of right now, drawing the things that haunt my mind and giving them life on the page. Thank you. You keep me drawing these demons out, in more ways than one. As for what’s in the future for the comic, I don’t know. It would be nice to see these in print, but I’m no self-publisher so it’s not something I have that much control over. But I’ll still be doing these, and remembering the five who won’t be reading them. Recently I had a problem with PayPal, and although I got myself through it, I thought I’d share my experience as a warning for those who use PayPal to receive donations from readers. In May, I found myself with a letter in my mailbox from PayPal telling me that my account was locked. I could no longer receive or send money, make withdrawls or do anything with my account when I logged into it. I had nearly $1000.00 in it so this sent me into a panic. I have had a PayPal account locked on me before because I did a nsfw comic, and I knew they were very unforgiving when they decided to lock accounts. But depression comix was okay, I thought, why would they lock me out again? The problem was donations. For a long time, I had used the donation button on the site, using it like a tip jar. There are thousands of other sites that do likewise, and many WordPress donation plugins advertise themselves as such. You just plug it in and go, right? If PayPal had a problem with it, they wouldn’t let you do it, right? The first thing I saw when I logged on was a formal request to send documentation: identification like a driver’s license, a recent bank statement, and a utility bill showing my name and address. They also wanted me to document and explain recent donations. Furthermore, they wanted documentation verifying me as an NPO. Now this last piece was specifically a stunner, as obviously I am not a non profit organization. I thought for sure I was going to be locked out of my account forever. I called PayPal and they swiftly admonished me for accepting donations when I wasn’t an NPO. They told me to get the documentation together and send it. I had a problem with my bank (I chose the paperless account and wasn’t receiving bank statements so that took a couple weeks to sort out), but soon I had all the documentation ready, and I made another call. Once again I had to explain that I was not an NPO. Although the person on the other end was pleasant, I was made to log into the depression comix site and remove all instances of the words “donation” and “donate” from the site while she was on the phone. When she was satisfied that I was no longer stating on the site I was accepting money as donations, she removed the limitations of my account and warned me that if I reverted the edits, I would be locked out again. This was a huge pain and it took the better part of three weeks to get resolved. That’s three weeks of not being able to use my PayPal account or knowing whether or not I would have to say goodbye to $1000.00 and my PayPal account. If you use PayPal and you advertise you are accepting donations and you are not a NPO, you are at risk for an account limitation. I’m not saying this to be threatening. I just didn’t hear they were strict until it happened to me. I think I got flagged when a week earlier, someone made a donation and then rescinded it saying it was made without their authorization. Even after I refunded the money immediately when I received the dispute the next day I got the limitation. So, using the word “donations” on sites accepting PayPal as a method means they expect you to be a NPO. I hope this story saves someone out there some aggravation. You do not want a PayPal employee to walk you through your site making changes on it. As for “donations” I don’t accept them anymore, I accept contributions made through the Send Money option. If you would like to make a contribution, my gracious thanks in advance, but we can’t call them donations any more. 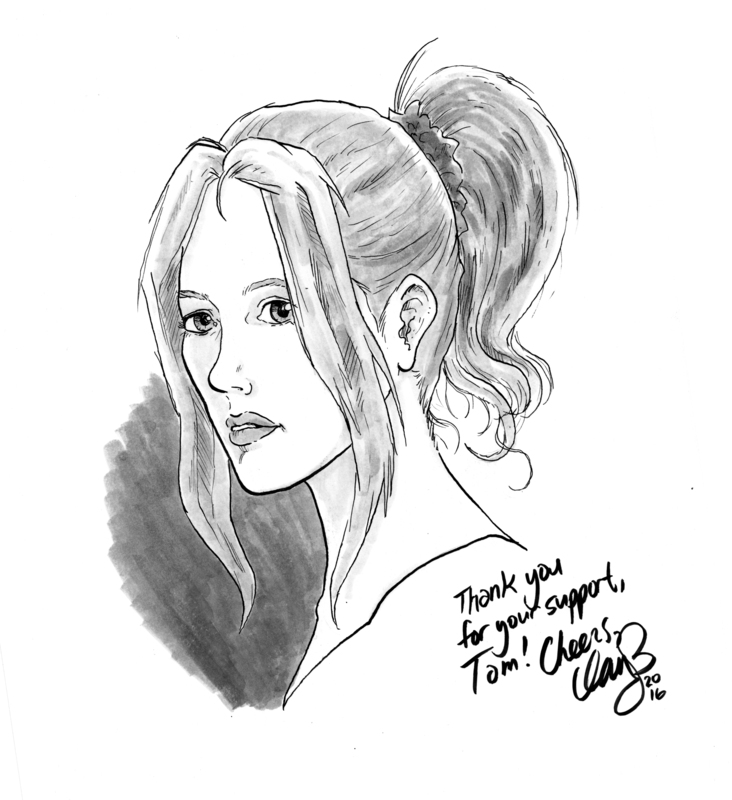 The June sketch winner on Patreon was Tom Campbell, who selected depressed character #2 (Robin) for his sketch, which will be mailed to him shortly. This one was a late and I apologize — June is a busy month for my full time job and I didn’t get as many chances to draw as I usually do. Thanks for everyone’s support, and July will bring a new sketch and a new winner. This week depression comix was featured on Discover WordPress, a blog maintained by the folks over at Automattic to spotlight blogs either hosted on WordPress.com or using the WordPress platform on their own server. It was a great opportunity and I got to be interviewed. You can read it there if you like, I field questions basically on how depression comix is done, talk about one strip that was popular and another that was difficult, and the importance of maintaining a presence on as many social networks as you can. I talked offhandedly about another comic I had done long ago, and how it was my first attempt at a comic about depression. When I was asked what the URL was, I realized that there was none, and if I didn’t make one soon I’d lose an opportunity to have it linked. So last week, I tried to get “A Heart Made of Glass” back online again so it would have a more or less permanent URL. “A Heart Made of Glass” was my first foray into webcomics. It was supposed to be published as a regular comic book but along the way I discovered webcomics and decided it would be better as that instead. AHMOG is an autobiographical comic book about how and why depression took over my life, but I never got that far into it as it was kind of painful to revisit. However, reading it over I can see how it is linked to depression comix, some of the things the protagonist says wouldn’t be out of place in depcom. I was just learning to draw comics so the art is terrible in many places, but my lettering hasn’t changed a bit in the 18 years since I started. I’m totally glad I got out of the anime style, it’s painful to look at my initial amateurish emulation of it. But what’s interesting to me is to see how I kind of come around full circle – I pretty much do depcom in a similar way to AHMOG, with blue pencils, dip pens, and Ames lettering guides with lowercase lettering instead of uppercase. There was no Photoshop manipulation on AHMOG and there’s none on depcom either. I didn’t realize it until I wrote this paragraph. If you’d like to read it, the first two chapters are here. There’s also a side story where I wrote a creepy love letter to no one in particular, and soon I’ll post another side story that I did as a quickbook way back “One Man World”. I hope you find something worthwhile in these, and hopefully it was worth posting. 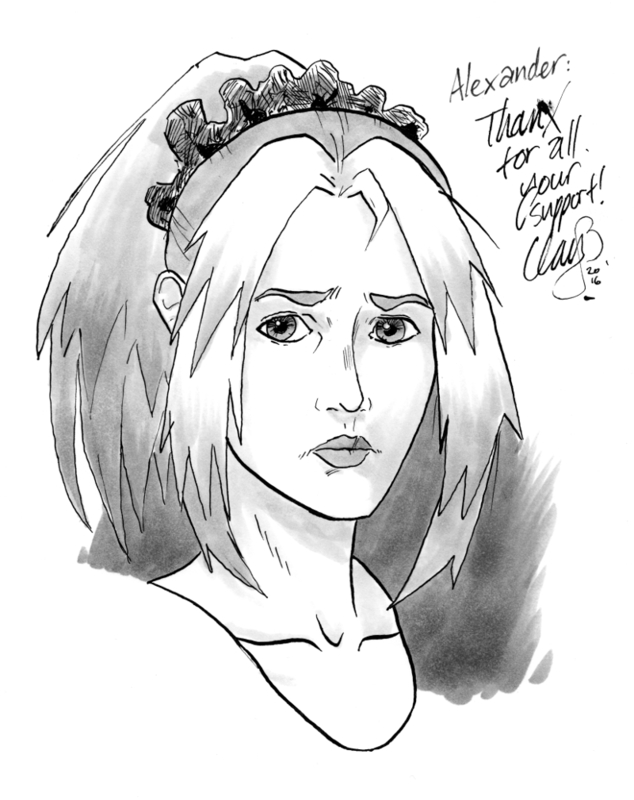 Congratulations to Bryce Maryott who was the Patreon free sketch winner for April 2016! Bryce didn’t give me a request for a character, so I chose Society. Like the others, this was done with dip pen and Copic markers on Kent paper. This will be in the mail to Bryce this week. Thank you so much for your support everyone, and next month we’ll have a new winner.